Pure Minerals Limited (ASX:PM1) continues to deliver incremental progress at its 100%-owned Battery Hub manganese project in WA’s Gascoyne region. PM1 has strong intentions of defining its maiden manganese JORC Resource in the region in the foreseeable future and intends to continue 2018 in a similar vein to how it closed out last year — with plenty of activity. PM1 finished up 2017 by completing 42 drill-holes at its Julia prospect and delivering 43 significant intersect targets for further follow-up work. According to the company, its average intercept thickness was 8.9 metres with a weighted average intercept grade of 7.4 per cent manganese. The average maximum depth of intercepts was reported as 20.6 metres — considered a positive result which could indicate that much of the manganese Resource PM1 hopes to eventually define will be bulky and at shallow depth. This could then translate into lower production costs per unit of production and raise the chances of PM1’s Battery Hub Project reaching economic viability. Furthermore, PM1 says that 39 of its 43 intercepts exceeded 5.0 per cent manganese with an average intercept thickness of 7.6 metres and a weighted average grade of 8.3 per cent manganese. In addition, 18 significant intercepts exceeded an average of 10 per cent manganese with an average intercept thickness of 6.2 metres and a weighted average grade of 12.6 per cent manganese. 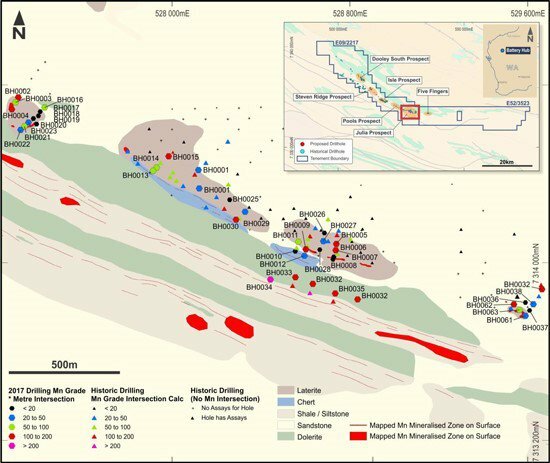 Late last year, PM1 completed a 79 hole, 2,880 metre reverse circulation drilling program, testing for shallow (less than 60 metre depth) manganese mineralisation with bulk tonnage potential at the Julia, Pools, Isles and Steven Ridge prospects, all located within tenement E09/2217. At the time, PM1 geologists set a further objective to confirm historic drilling for which no physical records remained. More than 1,500 samples, comprising 413 composite samples and 1,125 one-metre split samples, were submitted to ALS Global laboratory in Wangara, Western Australia, for assay test work in December 2017. These results are expected to be received and published in the coming months which could have a material effect on PM1’s valuation. 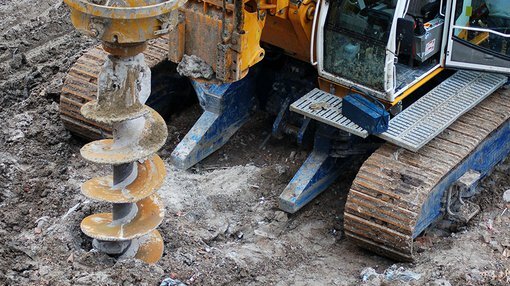 With many results still pending, the company intends to utilise the drip-feed of drill data it is receiving on a near-weekly basis, plus the historic database of more than 500 drill holes, in the calculation of a maiden JORC Resource later this year. In a market update, PM1 said it intends to “release results from an additional 37 holes from the First Phase drilling programs at Pools, Isles and Steven Ridge in the coming weeks”. These results are likely to contribute in planning the Phase 2 drilling campaign within the E09/2217 tenement at Battery Hub. Phase 2 is expected to commence in early 2018 and will include exploration of the prospective Five Fingers prospect, including preliminary metallurgical test work aimed at determining whether PM1 has the capability to beneficiate the mineralised material recovered at Battery Hub — a key determining factor as to whether PM1’s mined material will be able to be sold to electric-vehicle battery manufacturers once the company enters production.